Cuppers is CDC's annual friendly dance competition, consisting of 2 parts: the Open contest and the Inter-College Team Match. It is usually held in the Lent Term but sometimes in the Easter Term. The competition reflects the styles offered by the CDC, with events for Modern and Latin and sometimes also Salsa and Rock 'n' Roll. Do I need to be a student to take part? No, you do not need to be/have been a student to take part in the beginner and open competitions. However, all those competing in the Team Match must have or have had an affiliation with a college at some point in their lives. Not necessarily. Most people who enter prior to the event will have some idea of who they are going to dance with as it gives them the opportunity to practice. However, if you don't have a particular person in mind, you are more than welcome to fill in an application form - either online or on the day - and we will pair you up before your event begins. A perfect way to meet new people! I've never competed before. Does that matter? Absolutely not! All the more reason to come along and see what it's like. Who knows, you may catch the competitive bug and then there'll be no stopping you! I don't go to DanceSport classes. Can I still enter the Modern and Latin events? You certainly can. We would like to see as many people as possible there on the day, whether you're a regular competitor or a social dancer. Cuppers is a celebration of our diversity; the events should reflect that. How do I know what level to enter? Beginners' events are restricted to those who began dancing that particular event style at the beginning of the current academic year (October) or later. In some years, we have had novice, intermediate and advanced levels for the Modern and Latin events. 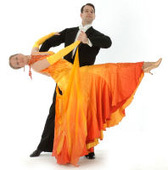 Normally, we would suggest those going to Improvers/A classes enter Novice, those going to A/B classes enter Intermediate, and those regularly attending B/C/Advanced DanceSport or Latin classes enter Advanced. If you enter the open events, there may be several first rounds (depending on the number of entrants) and couples will then be sorted by the judges into novice, intermediate and advanced categories. Which means you don't have to worry which level you are - just come along, and we'll do the work for you! What is competitive dress, and why can't I wear it? Competitive dress is the sort of thing you would see the stars wear on Strictly Come Dancing - fancy dresses for the women, tail-suits for the men, lots of fake tan, make up and glitzy jewellery. it's very difficult to pair up two people when only one is wearing competitive dress. What should I wear instead? You can wear anything you like. We recommend longer skirts for women in ballroom but, as long as you can dance in it, you can wear it. I'm a member of an all-girls' college. What should I do? form partnerships with men from any college that does not require them for its own team. These men must be released from their college team by the captain as stated in the Cuppers Rules. Can I drag my non-dancing friends along to watch? Certainly! Please bring as many spectators as you can beg/borrow/steal - don't forget, it's free! How do the open events work? Please see 'How do I know what level to enter?' above. Are there any step restrictions? No. The beginners' competitions are restricted to those who have been dancing since the beginning of the academic year, and the open competitions are not restricted at all. If beginners would like to compete in the open competitions, they are more than welcome. What are heel protectors and where can I find them? Heel protectors are pieces of plastic worn over the heels of dancing shoes to prevent the heel being worn away and to protect the floor. What do WQCJ stand for? Prizes will be awarded at the very end of the evening following the Team Match, which everyone, even those who aren't competing, are encouraged to stick around for. Prizes will take the form of medals, trophies, certificates and vouchers. There may or may not be edible prizes, but these will be in addition to not instead of the formal ones. See the Cuppers Rules for more information regarding mark schemes and the people to whom prizes will be awarded. Is there only one round for each event? This depends on the number of dancers. Obviously, there is a limit to the number of couples who can dance on the floor at any one time. Typically, there will be one or two rounds in the beginners' categories, and then the final. In the open events, there is a preliminary round where the couples are put into novice/intermediate/advanced categories, and then as many rounds as necessary in each of those.